Ancient Egypt was one of the greatest and most powerful civilizations in the history of the world. It lasted for over 3000 years from 3150 BC to 30 BC. The civilization of Ancient Egypt was located along the Nile River in northeast Africa. The Nile was the source of much of the Ancient Egypt's wealth. Great Egyptian cities grew up along the Nile as the Egyptian people became experts in irrigation and were able to use the water from the Nile to grow rich and profitable crops. The Nile provided food, soil, water, and transportation for the Egyptians. Great floods would come each year and would provide fertile soil for growing food. Historians usually group the history of Ancient Egypt into three major kingdoms called the Old Kingdom, the Middle Kingdom, and the New Kingdom. It was during these times that Ancient Egypt was at its strongest. The times between the Kingdoms are called intermediate periods. Ancient Egypt was rich in culture including government, religion, arts, and writing. The government and religion were tied together as the leader of the government, the Pharaoh, was also leader of the religion. Writing was also important in keeping the government running. Only scribes could read and write and they were considered powerful people. 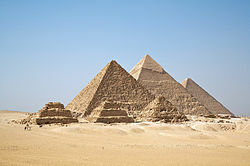 The Pharaohs of Egypt were often buried in giant pyramids or in secret tombs. They believed that they needed treasure to be buried with them to help them in the afterlife. As a result, archeologists have a lot of well preserved artifacts and tombs to examine in order to find out how the Ancient Egyptians lived. The Ancient Egyptian Empire began to weaken in about 700 BC. It was conquered by a number of other civilizations. The first to conquer Egypt was the Assyrian Empire, followed a hundred or so years later by the Persian Empire. In 332 BC, Alexander the Great of Greece conquered Egypt and set up his own ruling family called the Ptolemaic Dynasty. Finally, the Romans came in 30 BC and Egypt became a province of Rome. Sightseers: A guide to Egypt in the time of the Pharaohs by Sally Tagholm. 1999. Eyewitness Books: Ancient Egypt written by George Hart. 2008. Mummies, Pyramids, and Pharaohs by Gail Gibbons. 2004. The Penguin Historical Atlas of Egypt by Bill Manley. 1996. What Life Was Like on the Banks of the Nile by the Editors of Time-Life Books. 1997. Go here to test your knowledge with a Ancient Egypt crossword puzzle or word search.